One needs to make the most of visits to the Estadio Vicente Calderón these days. Why? Well, in a year or two from now, the bulldozers are going to move in, flatten the place, and turn it into flats. The Club - whose owners previously stated they'd never leave - will then relocate to a soulless athletics stadium near to Madrid airport. You won't meet a single Atleti fan who thinks its a good idea. This is just the start of their myriad of problems. Atletico Madrid is simply a madhouse. The two owners; Gil Marin and Enrique Cerezo - who, fraudulently, acquired the club in 1992 - can't stand each other. The fans hate the pair of them as well as a fair few of their players, who regularly leave through a revolving door, as do the managers - 9 in six years for Spain's third biggest club, in which time their trophy cabinet has remained bare. Did I mention that they are also hopelessly in debt to the tune of €300m? Also (there's more - Ed? ), recently, to appease fans who he'd previously tried to buy off, Gil wrote an open letter to them saying 'come along chaps, lets all be mates'. This resulted in a march of 7,000 fans calling for both his and Cerezo's noggins and riot police moving in to disperse those fans. Apart from that everything is tickety boo. After a week in rural Spain (whereby I'd got myself into one or two 'Littlest Hobbo' type adventures eg cutting up two pigs from start to finish to make about 1000 chorizos) it was on to Madrid to resume normal service - futbol y cerveza. I stopped off in the city of Cuenca en route which is famed for its free tapas. First tapa served up with my opening beer of the day? A whole pigs tail. I oinked my approval, snorted down several more beers and then moved onto the capital. 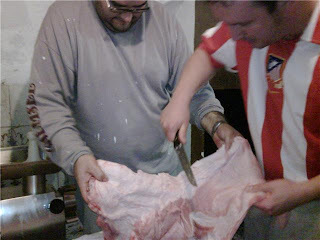 My cousin-in-law Victor and I (shirted up) cut open Guti...sorry a pig in Salinas del Manzano. After parting with the thick end of 50 quid for a ticket at the ground, I popped into the Sport Arena bar next to the clubs impressive museum. In an attempt to clear the clubs debts, they were cheekily charging €2.50 for a caña (less than half a pint) so it was only fleeting visit. As luck would have it, there are a couple of bars opposite the stadium. The ultras were letting off bangers and fireworks outside the front of one of them 'El Parador' (and this was 3hrs before kick off! ), so I opted to go in El Chiscon De La Ribera next door. In here they sold a 'mini' of beer for €6. Mini by name but size of a bus by nature. A mini equates to about a litres worth of strong beer - nice. Sport Arena bar next to the museum. Expensive beer not pictured. El Chiscon De La Ribera - 2.5hrs well spent in here before the match. Still love Torres (tick), still hate Real Madrid (tick). He (Kun) was injured unfortunately so this is all I saw of him. Might have left by the time you read this anyway. Atleti v Real Madrid Subbuteo. Yours for just €50. Those debts won't pay themselves! Inside and it was good to see that Sevilla had brought along 3000 away fans. They hadn't though had they. This is Spain. Despite the fact the AVE can get you from Sevilla to Madrid in two hours - they had the backing of 20 (twenty!) fans. It was however rather splendid to see the booze ban being flaunted. Hip flasks were all the rage, as were the odd bota de vino and even a few cans of beer. Three young lads in front of me also had a couple of 'Camberwell carrots' on the go for the duration of the match. Unlike at the Bernabau, sheets of noise emanate from the stands of the Calderón, mainly from the ultras in the "Fondo Sur" but quite often, everybody joins in and gives their vocal chords an airing. As expected, Sevilla took the lead early doors with a looping Renato header from a corner on 17 minutes. It was a really soft goal and led to more calls for the board to leave. The score remained the same until a comedy moment just the other side of half time. Diego Forlan was sent racing through one on one with the keeper, who cleared his fairly weak effort, only for the ball to rebound off a Sevilla players hooter and head straight into the net. This resulted in me being swept of my feet by all those around me and a bout of high fiving ensued. The usual flurry of yellow and red cards followed. Then, just as the referee was about to blow for full time up popped Antonio Lopez (of course Antonio Lopez) and with his noddle, he sent 35,000 into absolute ecstasy by heading in a 93rd minute winner. By now I'd been accepted as a new colchonero and the high fiving had turned to manly cuddles. For a moment, the long suffering fans of Atleti who are famed for embracing a loser's role and are generally proudly pessimistic, packed up their troubles in their old kit bag, and for once - smiled, smiled, smiled. Not for long though. Afterwards, they headed around to the main stand to protest once more and let off a few more bangers in the direction of the board. Its always great going to see Altetico Madrid. So good in fact that I'm returning in April for another game. See you there Los Colchoneros! Scarves aloft in the Fondo Sur. Hip flask sneaked in (tick). Duscher receives his marching orders. Twenty Sevilla fans (top left) make the effort. Fair play to them. Shame on the rest. Atleti players have a cuddle. It was minus 2 degrees to be fair. For more photos from the day CLICK ME. 7 inches of snow and freezing in England! Know I'm not the first to say it, and won't be the last, but a great site Danny. Tend to restrict my football travels to rare Spurs Euro campaigns, but would happily spend months on EFW trips if wallet & wife would allow. 'Til then, you're living the dream and filling me in! Ta again for reminding me what the internet is for. Cheers & Happy New Year to beer & football lovers everywhere. Good stuff as always. Got kicked out of the stadium a couple of years ago after a comedy misunderstanding with a steward, wasn't even a game on at the time. Sad times. Keep up the good work and hope to make it to the Oktoberfest. Anon - Thanks for that info old chap! Bruce - I'm blushing at those comments but they're very much appreciated. Kenny - Kicked out of a stadium by a steward whilst there wasn't even a game on!? A fair old effort that mate. Well done Sir. http://ticketfront.com/event/Atletico_Madrid-tickets looking forward to it.